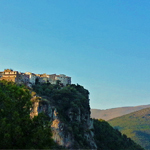 If you want to experience what time traveling might feel like, I definitely recommend a visit to Camerota. 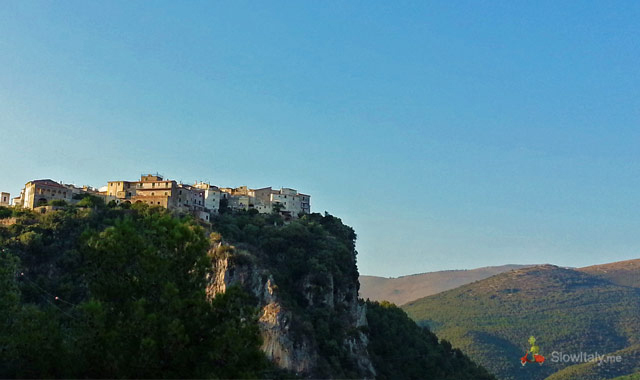 Chief town of the more famous Marina di Camerota, Camerota (the borgo) is a picturesque medieval hamlet, nested on top of a rock, at about 15 min by car from Marina di Camerota, in the province of Salerno. 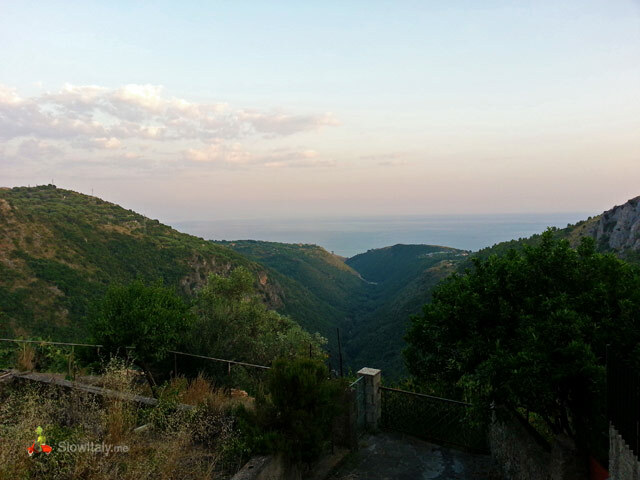 While Marina di Camerota is a bustling sea side resort, Camerota – the borgo – seems to have been lost in time. Little known – probably overshadowed by the fame of its seaside counterpart – it is its complete opposite: a delightfully tranquil, timeless little hamlet where less is more, offering an inviting escape from the hectic and exuberance of the touristy resorts. 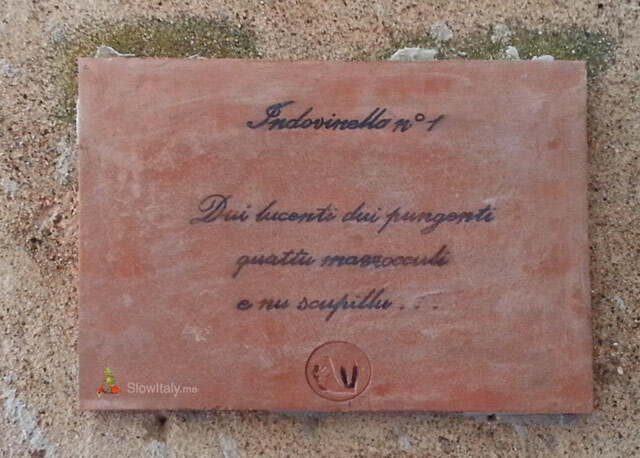 Similarly to the town of Palinuro, the village’s name is linked to Greek mythology. Legend has it that Palinurus, the helmsman of Aeneas, was infatuated with the seductive nymph Kamaraton, beautiful as a goddess, but with a heart of stone. Rebuffed in his advances, Palinurus pursued her image to the bottom of the sea. Declared guilty by the Goddess of love Aphrodite, Kamaraton was turned into a rock facing the sea, eternal witness to the place where the unfortunate lover met his fate. 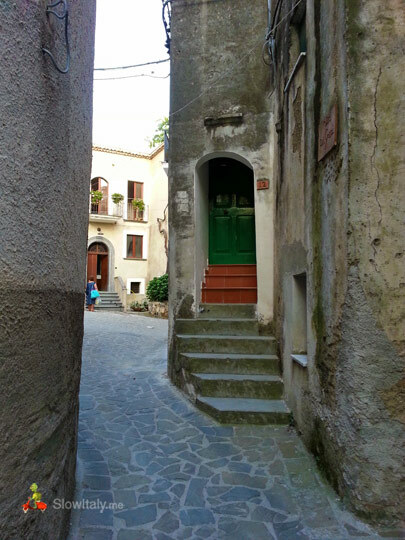 A more etymologically accurate explanation is that the name of the village stems from the greek Kamaratos, meaning ‘curved’ or ‘made with curves’, referring to the village’s winding streets and many arches. 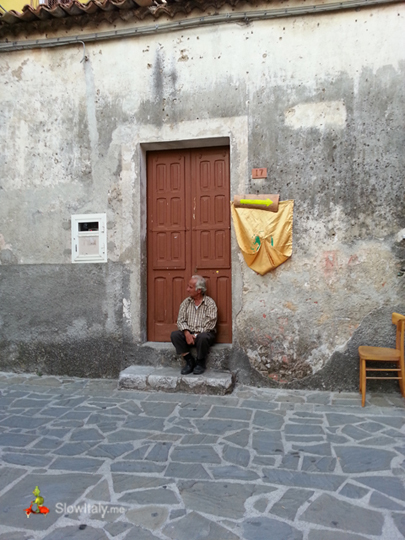 Once renowned for its handmade pottery, the village is also referred to as the “Vietri del Cilento”. The Chiesa di San Nicola di Bari marks the entrance of the hamlet. When arriving by car, you will have to leave your car here and proceed on foot. 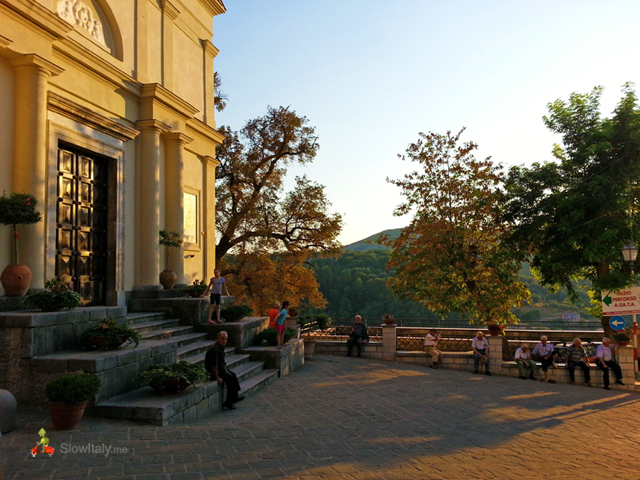 The first impression you get of the village – especially if you arrive just before sunset – is this wonderfully peaceful view of elderly people and children gathering in front of the church under the fading sun’s golden glow. A little bit further inside the village you will find a museum on your right showcasing the various crafts that were practiced by the village people. 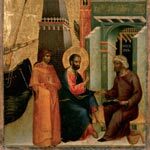 A visit to the borgo and the museum is akin to leafing through a yellowed family album, witnessing ‘live’ how our nonni and bisnonni might have lived a century ago. The museum is opposite this door on the right. 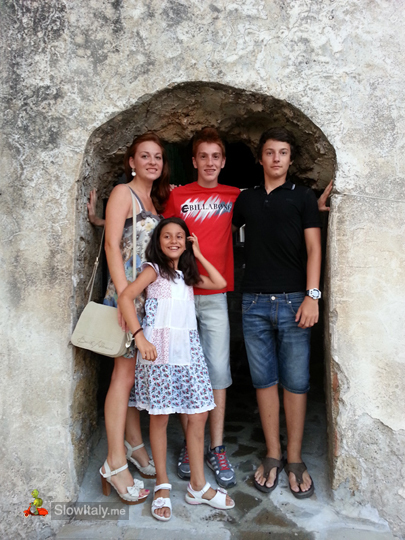 Friends of Slow Italy under one of the arches of Camerota. There was just an incredibly overwhelming SILENCE. A moment where you realize that in our everyday life we have really forgotten what silence, especially technological silence, is like. The moment felt like suspended (or going back) in time, with no sounds AT ALL, no cars, no scooters, no drills, no machines, lawn mowers, no air conditioning, no music or any of the things that make up our everyday acoustic landscape. 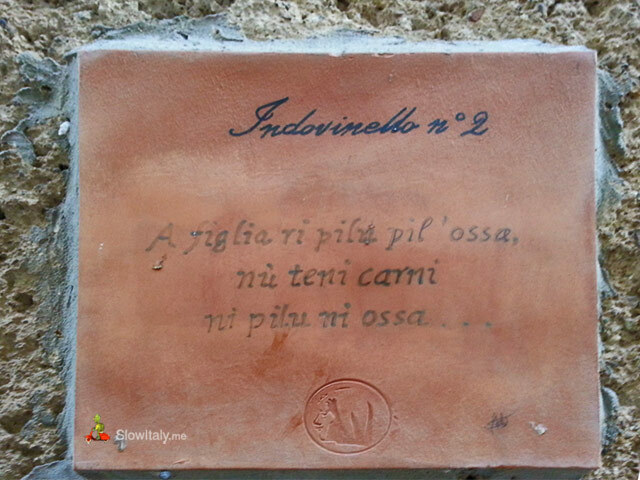 Plaques on the walls of the winding streets throughout the village feature indovinelli (riddles) and proverbs in Cilentan language. 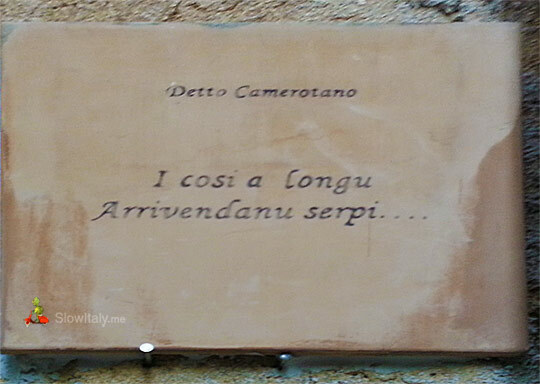 The proverb means (approximately): “Le cose portate a lungo diventano serpenti” (The things we keep delaying become snakes, i.e. become even more difficult to handle later on). 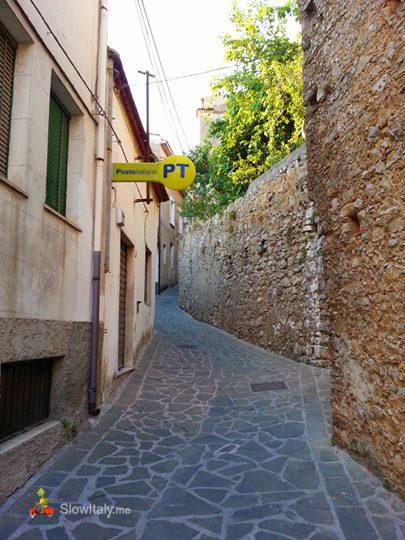 Without the sign, no one would ever guess that the post office is in this street, would they? After a lovely walk, we had dinner at the Antica Osteria del Borgo, a very casual, but amiable little restaurant, in the main street of the borgo, offering local pasta dishes and other cilentan specialties. 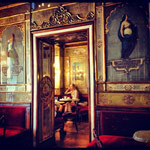 If you want to dine in an authentic cilentan Osteria, then this is it. 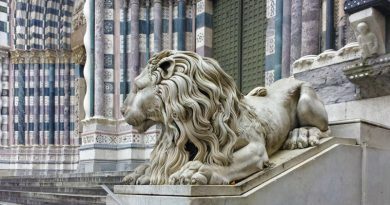 The atmosphere is very characteristic, with the staff speaking in the local dialect (don’t worry, they also make themselves understandable in other languages) and kidding with guests. 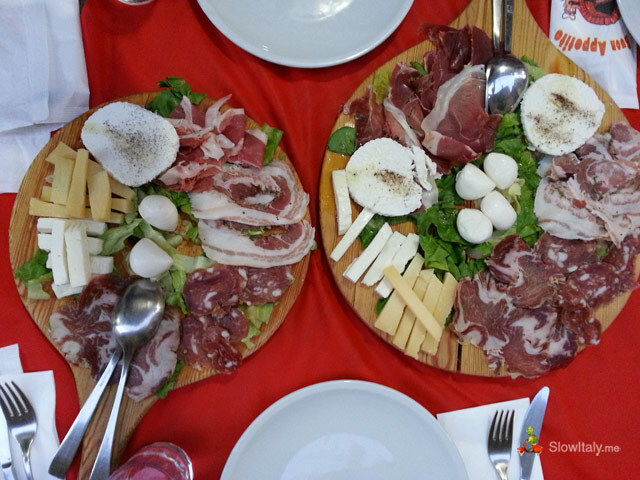 Photo © Antica Osteria del Borgo. At night the atmosphere becomes absolutely enchanting. 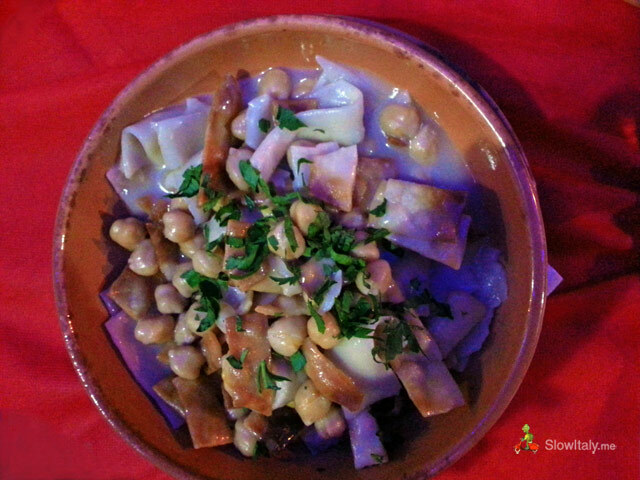 The restaurant tables are lined outside in the street, but the street is so narrow and nicely light that it feels like you are sitting in someone`s dining room. We had ordered so many different dishes that we couldn’t finish them all. When we went inside the restaurant at the end of the meal we saw an inviting cheesecake that really looked delicious. So, we asked the waitress why she didn’t tell us they had this wonderful cheesecake and she told us with a kidding smile: “You didn’t finish your pasta, so you don’t deserve dessert”. Can it get any more homely? 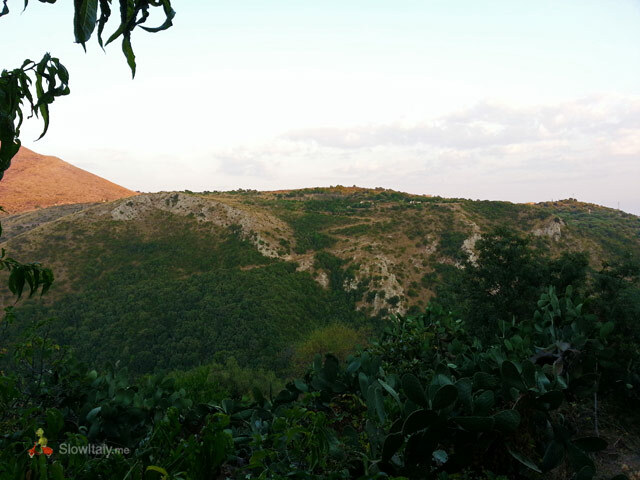 A place to definitely put on your bucket list if you are staying in the area. One last thing, if you order wine, don’t expect to drink it in appropriate wine glasses; the wine is poured in terracotta cups, a custom reminiscent of the borgo‘s pottery-making tradition. Explanation: two bright things (the eyes), two pricking things (the horns), four short sticks (the legs) and a streetsweeper (the tail), i.e. the cow (ox, or bull). Explanation: pilu pil’ossa, ‘the animal with hair and bones’, is the goat and her ‘daughter with no hair, no meat, no bones’ is the ricotta. 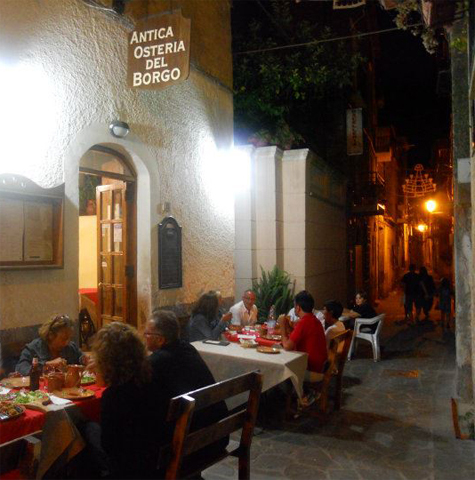 Photo credits: all photos © Slow Italy, except street view of the Osteria © Antica Osteria del Borgo.